If your baby is aged four to six months old, then it is the best time to introduce your baby solid foods. After the age of six months, milk alone can no longer give the appropriate nutrients your baby needs. The baby has to learn how to eat different foods of different consistency and texture. This venture begins with a simple taste of a baby food. Each tasting session can do as much as a teaspoon for every variety. It could be mashed peas, broccoli, porridge, and other soft foods that the baby can actually handle. This is the correct time to introduce the baby new tastes. If the baby is adventurous, he or she will actually look forward to these tasting sessions. Some babies are not open to quick changes easily. If the baby refuses the new taste, you could give a familiar taste by adding some breast milk or formula milk before offering it to the baby again. The important thing to note here is that the food that you give your baby as of the moment will awaken the baby’s taste buds to new heights. If you wean a baby onto broccoli, time will tell if it can become his favorite food or not. This is the time to get baby to eat and to appreciate spinach and carrots as well as the usual meats that your family might eat. Tofu can be a great food to introduce to baby as it is very soft and healthy. As baby gets older, a healthy porridge full of proteins and veggies would be really good. Now is the time to serve baby mashed-up versions of all the healthy foods you wish he or she would continue eating way past this stage of his or her life. You can buy all sorts of baby food in stores that sell baby products. For convenience sake, buy plenty of bottled baby food for babies if the raw versions are scarce. Use a clean spoon to take out baby’s portion for a meal and refrigerate the rest. A microwave oven can heat up that meal nicely. Anything not consumed in three days must be thrown away. Anyone who complains about wastage would be welcome to eat up the leftovers. You can make your own baby food. For that, you need a food mill, food processor or a baby food maker. Just boil the veggies and then use the food maker to grind or chop it into a smooth paste. One thing though, the baby’s immunity is not yet as strong as adults, so you have to be very careful about hygiene when you prepare their food. You should sterilize everything that can come into contact with baby’s food to keep everything as sterile as possible; to avoid any health concerns. 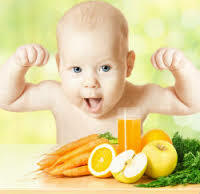 Whether you get ready made baby food or make your own, this is the time to steer your baby towards healthy food. Invest on one of the best baby food maker for the money now.